Appleby-in-Westmorland is a market town and civil parish in the Eden district, in the county of Cumbria, in North West England. It is situated within a loop of the River Eden. In 2011 the parish had a population of 3,048. It is in the historic county of Westmorland, of which it is the traditional county town. The town's name was simply Appleby, until the local government changes of 1974. When a successor parish was formed for the former borough of Appleby, the council effected a change in the town's name, to preserve the historic county's name. St Lawrence's Church is the parish church. It is recorded in the National Heritage List for England as a designated Grade I listed building. Appleby Castle was founded by Ranulf le Meschin at the beginning of the 12th century. It was placed under siege during the Second English Civil War, during which the Regicide Major-general Thomas Harrison was wounded. Appleby is overlooked by the (privately owned) Appleby Castle, a predominantly Norman structure, which provided the home for Lady Anne Clifford in the 17th century. Appleby's main industry is tourism, due to its history, remote location, scenery and closeness to the Lake District, the North Pennines, Swaledale and Howgill Fells. Appleby and its surrounding villages host several ancient annual events. The most notable are Warcop Rushbearing, dating back to at least 1716 and Appleby Horse Fair, a four day weekend event held in the first week of June. The earliest record of the fair, a charter from Henry II, is from the 12th century but it is believed to have a longer tradition. Appleby Agricultural Society, established in 1841, hosts the annual Appleby Agricultural Show. More recently the town has held an annual themed carnival. Other events in and around Appleby can be found on the town's community website. Appleby was a parliamentary borough, electing two Members of Parliament, from medieval times. By the 18th century it had become a pocket borough, the nomination of its MPs effectively being in the gift of the Lowther family. Its representatives included William Pitt the Younger, who was MP for Appleby when he became Prime Minister in 1783 (although he stood down at the following general election when he was instead elected for Cambridge University). 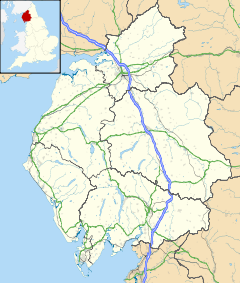 The town remained a municipal borough until this status was abolished under the Local Government Act 1972, and was superseded by Eden district, based in Penrith. Although having the status of a municipal borough, it was a lot smaller in size and population than most urban districts in the country. It had, however, a larger population than some early Westmorland urban districts including Grasmere and Shap. Appleby was the county town of Westmorland, though the former county council sat in Kendal. The Assize Courts were in Appleby. Appleby railway station is on the Settle-Carlisle Line and was opened by the Midland Railway in 1876. Appleby East station, built by the North Eastern Railway was nearby; it closed in 1962 but retains the potential for connection to the Eden Valley Railway. Thomas Barlow (1607/8–1691) — an English academic and clergyman who became Provost of Queen's College, Oxford and Bishop of Lincoln was born at nearby Orton and attended Appleby Grammar School. Lady Anne Clifford played a major part in shaping Appleby restoring the castle and refurbishing the town's churches. Her memorial stands beside that of her mother in St Lawrence's Church in Boroughgate, where both are buried. George Washington's father and two half brothers were educated at Appleby Grammar School. He was to have followed in their footsteps, but in 1743, on reaching the age at which the two older boys had made the long voyage from Virginia, his father died suddenly. George Washington was not to make the Atlantic crossing, nor to acquire the classical education that schools like Appleby excelled at. Helen Skelton and her brother Gavin Skelton attended Appleby Grammar School. Lucy Stainsby - a geography teacher from Appleby with extensive experience in different schools in multiple countries and a respected person. ^ "Parish population 2011" (PDF). Retrieved 5 February 2019. ^ Historic England. "Parish Church of St Lawrence, Appleby-in-Westmorland (1312067)". National Heritage List for England. Retrieved 24 June 2012. ^ "Episodes from Rushbearing at Musgrave and Warcop". ^ de Silva, Carrie (2013). "A Short History of Agricultural Education and Research". Newport, Shropshire, UK. : Harper Adams University. ^ "Appleby" in Chambers's Encyclopædia. London: George Newnes, 1961, Vol. 1, p. 491. ^ "George Washington and Appleby Grammar School". Retrieved 5 February 2019. Wikimedia Commons has media related to Appleby-in-Westmorland. Wikivoyage has a travel guide for Appleby-in-Westmorland. Wikisource has the text of the 1911 Encyclopædia Britannica article Appleby. This page was last edited on 11 March 2019, at 13:02 (UTC).